I blew my inheritance on this kit when the last of my grandparents died. It wasn't that expensive; but then there wasn't much money. At least I still have the thing. If programmable drum machines were around towards the end of the 70s I'd certainly never seen one. I'd heard rhythm computer stuff on a Tangerine Dream album but it wasn't really doing the job of a drummer. And I had a John Cooper Clarke e.p with a drum machine on it, out and proud. Mark and I went to the second (less star-studded) day of the first Futurama Festival in Leeds where Echo & The Bunnymen and The Teardrop Explodes both used rhythm boxes of some kind (if I recall correctly). Probably all these machines were stand-alone derivatives of the sort of thing included in home organs, with certain patterns hard wired in at the factory, and a few switches to alter sounds, tone and tempo. Somewhere along the time-line between Tangerine Dream and The Teardrop Explodes, Maplin Electronics featured this kit in their catalogue (which had started as a weedy pamphlet and doubled in size each year throughout the era). The Maplin "Drumsette" kit was part of their line of organ related goodies - the early catalogue proudly notes that a display model of their flagship self-build organ could be viewed at their shop (they only had one then). I don't exactly know what the cost of anything was in those inflation-crazy times as the price lists were supplied separately to allow for constant updating. Anyhow, I got the kit and soldered it together. Basically it had an off-the-shelf rhythm chip with fifteen rhythms built in, sending impulses to a set of resonator circuits to simulate the bink-bonk-bunk of the different drums, and a gated white noise source for the cymbals and snare wires. It was massively complex for such a simple result, with masses of logic chips enabling a touch-sensitive rhythm selection array, which then encoded the output from the fifteen touch switches into a four digit binary instruction to the rhythm chip. At first, before I figured out what was going on, I imagined that by touching two rhythm select pads at once it might be possible to obtain some wild double-drumming output. But no, the thing was pretty staid and nothing exciting would happen without further soldering. Having said which, there are those that contend that the audible fight between the Drumsette insistently bipping out a "Bajon" or "Beguine" rhythm and the bassist trying to - shall we say "rock" - was part of the early magic of the Automatons. Nevertheless, modifications were legion. Firstly (and not entirely successfully) I mounted a stereo jack on the back and arranged that a volume pedal could be used to control the tempo (what I hadn't figured was that in a range between, say, zero and 250 BPM only a narrow band in the middle is actually of much use, which is difficult to accurately hit with a foot pedal). In a related move I experimented with taking various pins in the clock circuit to earth to see which would stop (and allow the restart of) the beast without calamity. Though I did succeed in this, that did not prevent me often stepping on the footswitch in error, producing a little more randomness and human error that had originally been planned. By the time we went to record Peter Paints His Fence I had figured where the audio for each separate drum could be found (by dabbing an amplifier lead around hopeful-looking areas of the circuit board) and arranged a multi-pin on the back panel (now just a hole in the photos, as I recycled the socket later). This led to a mixer I'd built which was a cut-down clone of the ProKit 6-2. The engineer chortled somewhat as I turned up the drums one channel at a time and the snare drum went "bunk" very much like the high tom. Indeed, exactly like the high tom as it was the same sound, only with a squirt of white noise added. Due to a dry joint this squirt was missing but because I'd barely seen a real drumkit, let alone examined or even played one, I had not realised anything was amiss. The next innovation - once I understood what a snare drum was and how useful it was in popular music - was a button linking the clock pulse to the snare drum, which enabled an ad hoc drum roll to take us into or out of a chorus. This was mounted in the same diecast metal box as the stop/start button and sometimes I would step out hoping for a drum roll and get total silence instead as I hit the wrong switch. One particularly rainy afternoon in the sandpit at Meanwhile Gardens a grain of sand (or several) got stuck down the side of the drum roll button and it stayed down, rat-a-tat-tatting all the way to the end of the song and, eventually, the performance. Continuing the search for more variety I wondered about interfering with the pulse outputs from the rhythm chip so that they went to the "wrong" drums - at first I interrupted the pulse lines with a bunch of 1mm banana sockets and then with a 18-way multipin (both visible in the photo of the back panel)- the idea was to have a set of plug-ins with the favoured arrangements (say, bass drum pulse firing low & high toms together). The multi-pin plugs were expensive though and later I used a pin board fixed on top of the drum machine box. Finally I used a circuit board edge connector slot and made a series of veroboards with strips linked according to the intended arrangement of drums and pulses. These were also to have preset pots on them so that each song would have a ready made card that when slotted in would configure the drums and set the tempo, with only the rhythm pattern to be selected. If I'd thought of it (and I don't know why I didn't) the four lines which addressed the rhythm chip could have been included in the arrangement so that even the pattern would have been automatically selected by the song-card. Probably this hardware-heavy arrangement reached the end of the line as plummeting computer memory prices meant that programmable drum machine were beginning to become available. 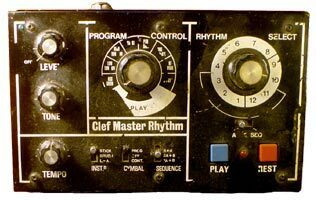 The Clef Master Rhythm came just ahead of the Boss Dr Rhythm but worked in a similar, if slightly less elegant way. I bottled out of building it from a kit as all that CMOS-chips-destroyed-by-static voodoo was really big then. Since then I've gone elbows-deep in lots of computer hardware without knowingly zapping anything but at the time I'd had a few failed kits (upon reflection, all from designs in Elektor magazine) and blamed myself for being a dry-jointing static-happy klutz. Coming assembled meant I didn't have the same bravado when it came to modifying the thing, though I did manage to devise a single push-on-push-off footswitch to stop and start it (unlike the pair of buttons on the front panel) - and I think the old snare drum roll trick was used too. The worst thing about the Clef was the volatile memory and the tedium of keying in every hit (and miss) of each drum one push at a time. I remember attempting to do this in the potting shed at the Meanwhile Gardens after finding the thing had got turned on in transit and flattened its batteries. I'd got as far as fabricating a cloned box from a sheet of aluminium with the same profile so that it could sit as an outrigger and contain - what? - I can't remember, probably some separate audio outs and front panel controls for resonance and accent intensity (which could be adjusted inside the box on preset pots)…but redundancy hit (these being the Thatcher years) and I didn't have the funds for further experimentation. Other plans included a link between the drum machines and a lighting sequencer, so that the bass drum would drive the lighting sequence - additional value here would be that even when we couldn't hear the drum machine live we'd be able to stay in time by following the lights. Though I made a start on the lights this project never was completed; partly due to the demise of the band and partly because I kept lending out the lights to people who brought them back with half the bulbs broken. Thanks guys.